The City of Cape Town is exploring all avenues to make water users aware of the need to save water while we still have it. The City’s Mayoral Committee Member for Area East, Councillor Anda Ntsodo, yesterday 27 June 2017 engaged with residents and commuters in the vicinity of the busy Kuils River public transport interchange. The City is currently focusing its attention on making residents and water users aware of the need to build water reserves during the winter months, especially in light of the harsh summer that is expected. This means continuing to reduce water usage even though the weather is cooler and wetter. Metro-wide, the City’s area-based mayoral committee members, as well as City staff, water inspectors and law enforcement officers, are continuing to spread the message of saving water even though it is winter. ‘Our dam levels remain critically lower than usual during the start of the winter and we don’t know when we’ll get rainfall or how much rain will fall. We are worried that our water users will start to relax their efforts and use more water because it is winter. We have had many enquiries from members of the public asking us whether we are now out of the woods and whether water restrictions have been removed. 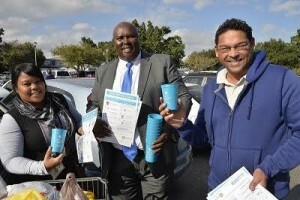 We are therefore using all of our resources to spread the word that we must continue to save water while we have it, come rain or shine,’ said Councillor Ntsodo. The City is envisioning stricter water restrictions. If implemented, Level 4b restrictions would help to adjust the water usage target downwards to 500 million litres of collective water use per day from the current target of 600 million litres per day. The City’s Water Resilience Task Team has been set up to boost the City’s response to drought, to ensure that acute water shortages are avoided, and to transform Cape Town’s water landscape into one that ultimately relies less on rainwater. The City continues with all of its planned and proactive interventions, such as pressure reduction programmes and emergency work, as well as taking tough action on those who contravene the existing Level 4 restrictions. Residents can contact the City via email to water@capetown.gov.za for queries or to report contraventions of the water restrictions (evidence should be provided to assist the City’s enforcement efforts), or they can send an SMS to 31373.